My head started swimming and I couldn’t open my eyes. I could feel broken stones crunch beneath my feet and I knew I was moving away from the protest. For a terrifying 30 seconds I lost track of what was happening. An autopilot sense of self preservation kicked in that my conscious self had little control over. Just as my senses started to return I felt a colleagues hand rest on my lower back and lead me to the side of the street. Here I crouched in the small amount of shade offered by the shop-front from the midday sun. My stomach had tied itself into a knot and my head felt like it had split in two. Only then did I realise that I must have walked away from my colleague who was now stood in front of me with her camera in hand. I glanced up an offered what I hoped was a reassuring smile. 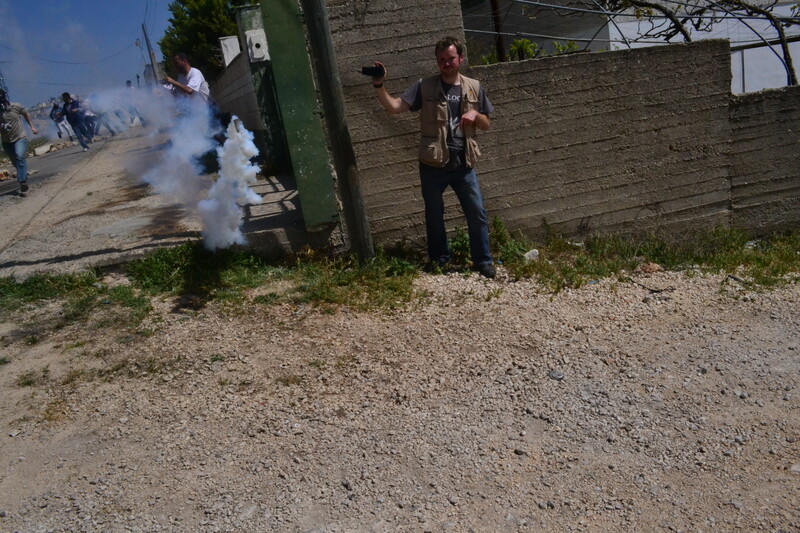 A few minutes earlier I had been stood at the back of a demonstration in Kafr Qaddum, a small village in the West Bank. I was there to monitor the proceedings and reporting on any human rights violations I witnessed. In the minuets preceding I had filmed a number of ‘warning shots’ being fired over the crowd and whiffed the faintest smell of tear gas. I believed I was far enough back though to avoid the worse of what was to inevitably come. I was stood on the side of the street next to a large wall that could also offer me protection, should it have been needed, from any direct fire. My colleague was nearby and I felt in control of situation. Seconds later the Israeli army fired a volley of tear gas canisters (some directly into the crowd) that filled the streets with a penetrating thick gas. At first I stayed in position as it appeared the soldiers were aiming just for the front of the protest. As the crowd turned to run however, the tear gas landed closer and closer to me. At this point one canister landed a few yards away and filled my lungs with the gas. What happened next is a blur. I remember a man kicking the canister away down the hill but little else. On the approach to the village earlier that day there were some clear signs that the protest was not going to pass peacefully. The Israeli Army had set up a series of checkpoints cutting off the only main entrance to village. I approached as part of a mini convoy of human rights monitors. I was travelling with others from EAPPI and the Israeli human rights organisation B’Tselem. As we approached the checkpoint it became abundantly clear that international human rights monitors were not being allowed into the village. Later I would find out that the same restrictions were being applied to media outlets. I already had reasonable suspicion to believe that this week’s protest at Kafr Qaddum was going to witness an escalation of violence on previous weeks. 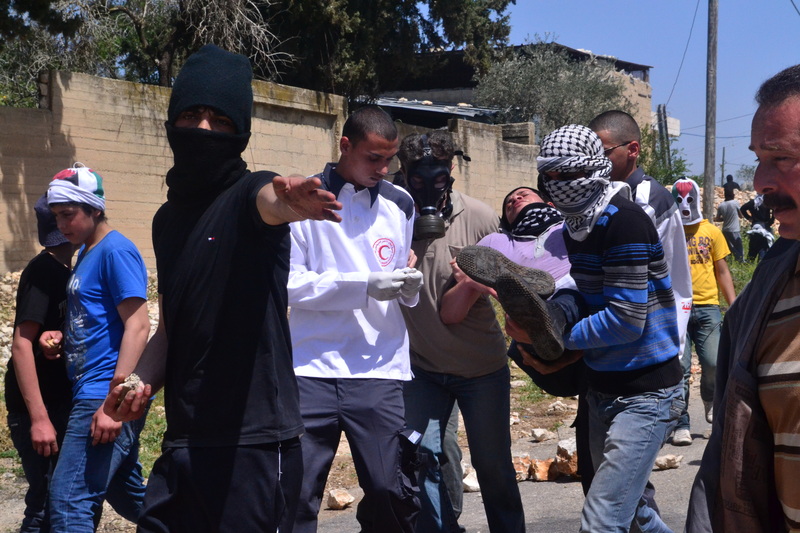 The day before the village had seen 19 of its residents arrested in an IDF raid. “It was a clear illustration of strength aimed to intimidate us and to stop us making protest” one villager suggested. There were reports that a large amounts jewellery had also been stolen during the raid. This combined with the checkpoints only heightened our unease about the protest. After meeting a series of other journalists, news agencies and human rights monitors who had also been turned away we decided to collectively head across the fields and enter the village “through the back door”. As the representative from B’Tselem put it, “if we do not reach the village today I am sure some very bad things will happen and they will go unreported”. Sadly, his prediction of violence proved to be true. Both the Israeli Army and boys and young men from the village once again illustrated their willingness to take part in acts of violence against one another. Before being ‘tear gassed’ myself I saw stones the size of my fist being flung through sling shots at the soldiers who then responded with the brutality that I am coming all to use to seeing. It is important, however distressing these scenes of violence are, that the world hears about them. Today I saw a large number of boys throwing stones before the Israeli Army fired tear gas directly at the crowd as a whole. The obvious difference in these actions is that one was undertaken by a professional army and the other by young boys in an occupied village.